This summer, I came across a blog called The NYC Game (link) and thought it was completely stupid. Then I read another page. This girl meets the culture and style mavens of NYC, finds out the experiences every true New Yorker should have, and then she goes and does them. Obviously, if you know a thing about 93 Plates, you know I immediately changed my tune about The Game. I have to give Michelle credit for being part of my inspiration for 93 Plates. It’s my own version of the where the goal is to eat at the city’s best restaurants and meet all the independent food writers in the city. I’m doing well so far. 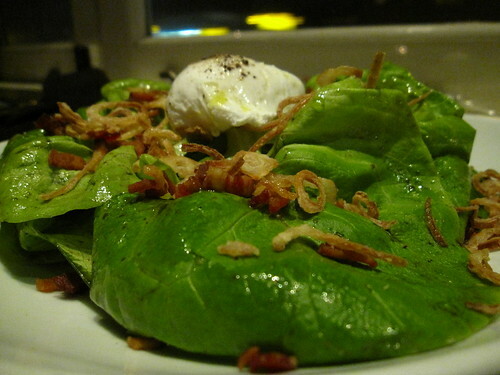 We started with the Bibb Salad (above). Crispy shallots, over-easy egg, and porchetta. It’s salads like this one that give ordinary salads a bad name. I think it had about as much cholesterol as a Big Mac. It was incredible and was gone from the plate in seconds. I made myself a little breakfast sandwich with the bread from the table, the egg, and the porchetta. 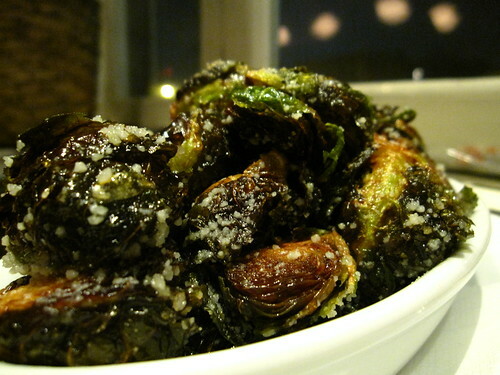 “Try the Fried Brussel Sprouts (pic)!” The voice on the phone said. “Huh?” I didn’t know what was going on here. Next up were the Meatballs (pic). They had a grana padana-like crunch to them, which was quite pleasant. I think they may have had some bread crumbs on them (we’ll get to that in a second). 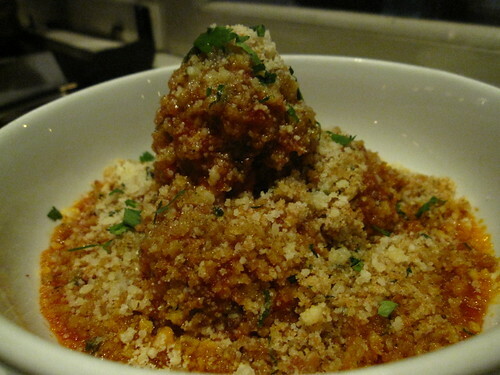 I was dying for some good meatballs since I thought I might get them at ‘Inoteca on Saturday and didn’t. These were fantastic. The dish that stole the show for me was the Pork Belly. It was too fatty for Michelle, but I absolutely loved it. It was roast with a rosemary and thyme that you could really taste. 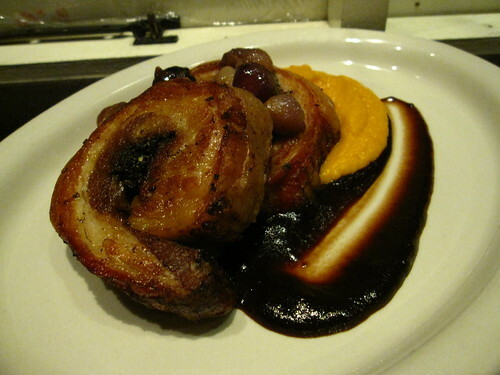 I dredged a slice of the belly in the white wine/prune sauce and the buttery smooth sweet potatoes – the sweet and savory flavors mashed together in my mouth – amazing. This is a must order when you come here. It was on special before and should be going on the menu full-time at the time of this post. 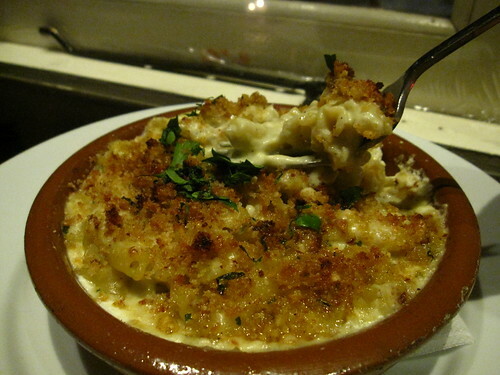 The other main course was the Cavatelli and Cheese (pic). The bread crumbs were like little explosions on my tongue. I told Leo he should start a side business just selling these things. I don’t know if this is coming anytime soon. 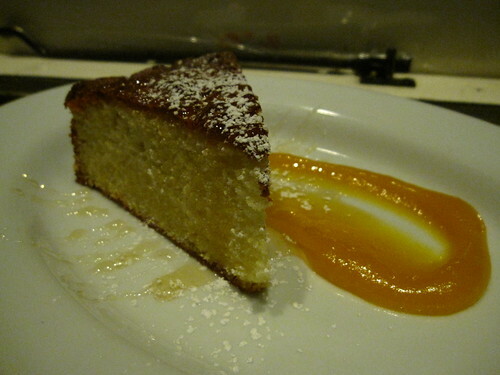 For dessert, we had the Baby Jesus Cake and an Pound Cake with Apricot Sauce (pic). The pound cake was better without the apricot sauce. The Baby Jesus cake – this stuff is the shiznit. 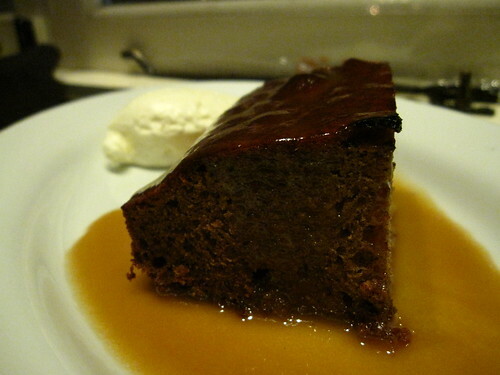 A date cake with a toffee syrup. I said it tasted like gingerbread covered in a heath bar. Michelle challenged my gingerbread call. She was right: no ginger, but I still think something can taste like gingerbread without having any ginger in it, right? Nearing the end of the night, she asked me about making her an NYC food challenge for 93 Plates after the project is finished, and I’ve got a few places in mind. I think I might just have to put the Fried Brussel Sprouts and Baby Jesus Cake at Vesta on the list. The IRL Arts Foundation and The Wandering Foodie thank Vesta for providing this meal.